Wooden toy blocks provide educational benefits in several areas, including, physical, social, intellectual, and creative. Playing with blocks, children learn about different shapes, improve their eye-hand coordination, and learn about gravity, balance, physics, spacial relationships, and help them learn how parts become a whole. When playing with blocks with other children, they learn how to cooperate. Interaction and imagination build creativity. as they learn about shapes, sizes, positions, and if the blocks are painted, colors. Grouping, adding, and subtracting blocks from architectural endeavors help children begin to comprehend the basics of math, including geometry. Basic construction techniques can also be learned. 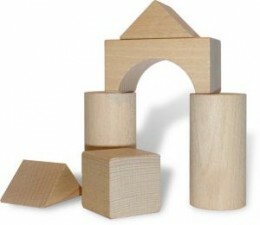 Wooden toy blocks provide creative stimulation for children. All they need to add is a bit of time and imagination to enjoy play time! wooden toy blocks was in Brooklyn in 1820! With such a large variety of shapes, this set is a great starter set. Children can build houses, castles, towers, bridges and more with this assortment. The 60 piece set stores neatly in a wooden crate, perfect for a shelf in your child's room. Or it can be turned upsidedown and used as the foundation for a fantastically creative architectural design. These blocks are sanded smooth to prevent splinters, and will provide hours and hours of educational fun. Do you think playing with blocks is good for kids?